Four years after the last episode of "Breaking Bad" aired, fans in New York City are apparently still crazy enough about the show to clamor for a chance to get into a pop-up bar, set inside a recreational trailer, based on the award-winning series. The "Breaking Bad"-themed bar called ABQ is expected to hit town this summer after a successful two-year stint in the UK, Eater NY reports. It'll be set entirely inside a "meth lab" RV resembling that of Walter White. The organizers of ABQ, a UK-based shop called Lollipop, says it's the "world's first cocktail lab in an RV where you can cook your own cocktails using molecular techniques, chemicals and potions." Inside, visitors will find a "makeshift laboratory to cook cocktails using molecular mixology techniques," organizers say. Among the offerings will be a Saul's C2H60, a semi-frozen cocktail using dry ice and an infusion technique called nitrogen cavitation, and Blue Flynn, a rum-based cocktail consisting of flavored acids and aromas, concocted in an elaborate setup of lab bowls and tubes. Bartenders will be dressed in the shows' trademark yellow jumpsuits, with "HEISENBERG" scrawled across the wall. Organizers haven't determined exactly where they'll install the RV, but are looking at several places in Brooklyn, they say. ABQ will open for several months beginning in July, with tickets starting at $45 for a two-hour visit and three cocktails in the bar. Fans can sign up for tickets on the ABQNY website, although they may have a bit of a wait -- the live waitlist shows over 1,700 people have signed up as of Thursday, and only 30 people at a time can enter the trailer. The ABQ website says 100,000 people have visited the UK pop-up so far. 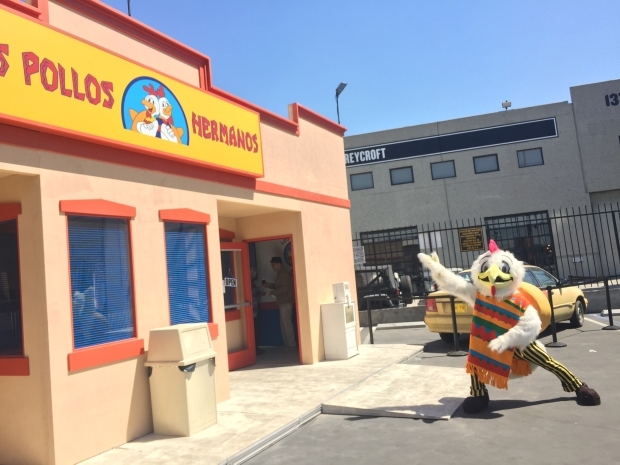 Last month, another pop-up restaurant based on the TV show arrived to a fan frenzy in New York City: Gus Fring's infamous chicken chain "Los Pollos Hermanos" saw huge lines -- just for curly fries, the only offering on the menu -- as AMC promoted the spinoff series, "Better Call Saul."